Having signed Fabinho, Keita, and Christie-Davies —all of whom are midfielders, it is important that the Reds make move for another attacking midfielder, who could also operate as a winger or centre-forward. According to reports, the Reds nearly spend £100m on both players as a way to upgrade their midfield’s positions but that is not yet enough for a team of such magnitude, should they want to lay claim for every trophy in the upcoming season. However, Jurgen Klopp is reportedly close to capturing Xherdan Shaqiri’ services, according to reports. The 26-year-old versatile player is still in Russia with Switzerland but he is reportedly set to ink a 3-year contract with the Reds. The Independent are reporting that the player is set to complete his £13m switch to the Merseyside club this summer after the World cup in Russia. 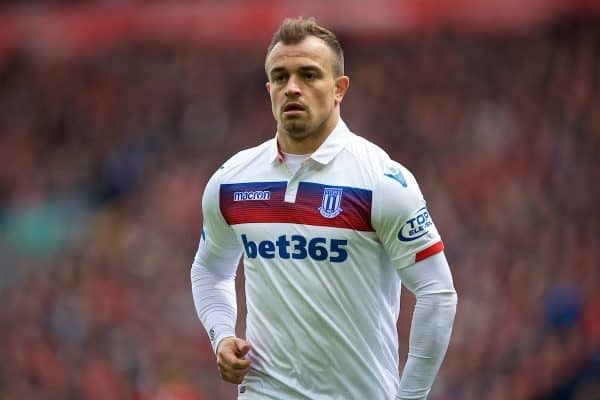 Shaqiri will leave Stoke City, who were relegated to the Championship League, ahead of next season and Liverpool are tipped as the perfect place for the player’s playing style. Should he join Liverpool, Shaqiri will add more grit, quality and threat to Klopp’s substitute bench and once he gets the chance to play, he would surely perform brilliantly to convince the German tactician he deserves more game-time. At 26, the Swiss is in his prime and it is a perfect time for Klopp to capture is longtime target.